Filou left us ten days ago. We have almost figured out our new routine, how life goes on without him. Almost, and only on the surface. I have not been myself, have not wanted to be myself – the one who was all swooped in and wrapped up, fierce about making a difference in the quality of his life, in the length of his life. The immense significance that is death weighs on me and that fierce version of me is now stone-cold sober, depressed, silent. It seems that a certain consequence of focused caretaking is coming to expect those around you to support the process by not being a burden to you themselves; that they will allow you to coast a bit on the typical expectations of the relationship. I did that. I definitely projected that request, repeatedly, to the rest of herd while Filou was alive: I am meeting Filou’s needs here, can you get along without much attention just for now? Can I cut corners here and there with you and not feel guilty? For a great part of this journey, the answer seemed to be yes, we’re all okay with that. But nearer what was the end, like the cuffs of my old chambray barn shirt, the fabric of us was wearing in the hardest used areas, the places where we rubbed up against each other. Daily chores were more complicated when I divided the herd in two – those with access to the barn (Filou) and those who could only come into the barn with permission. The barn had become important to all of them. It was shelter from rain, respite from heat, down time from each other, and the ability to eat in peace and now I was making it conditional for some of them. It was a lot of work for me – that is the story I told myself then and that I will tell you now – keeping them separate and shuttling the outer ring herd back and forth. So I started relying on acts of driving to make it manageable; a three-for-one deal, moving them as a group by the pressure I put on them. Evenings, I would open the gate to the barnyard and, with hay freshly laid in each stall as enticement, shoo the geldings and the donkeys in by swinging a short rope behind them. Driving. Like cattle or sheep. 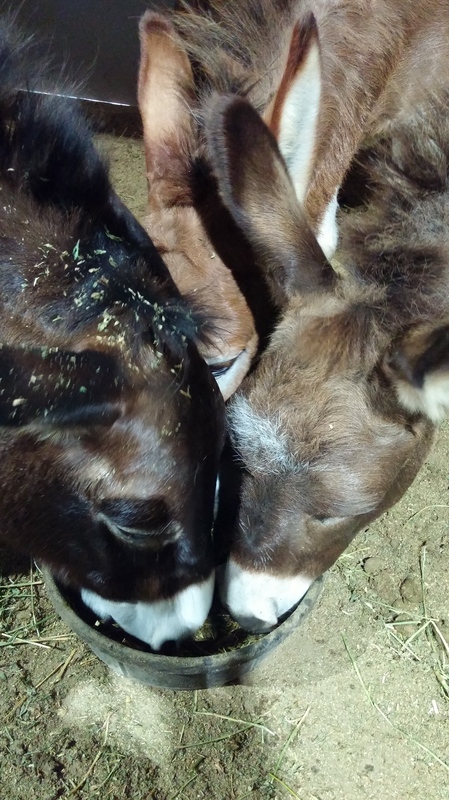 After evening feedings, I would often go to the house, leaving the gate and back stall doors open so that the gelding and donkey tribe could return themselves to the pasture at their leisure. More often than not though, no one left. Returning to the barn before night fall I would find them heads nodding, back legs cocked, and lower lips hanging, all of them let loose in a shared nap of companionship. But it’s almost dark and I still need to settle Filou in for the night, to mix and syringe his medicine down his throat, re-wrap his legs, refill hay racks and water. 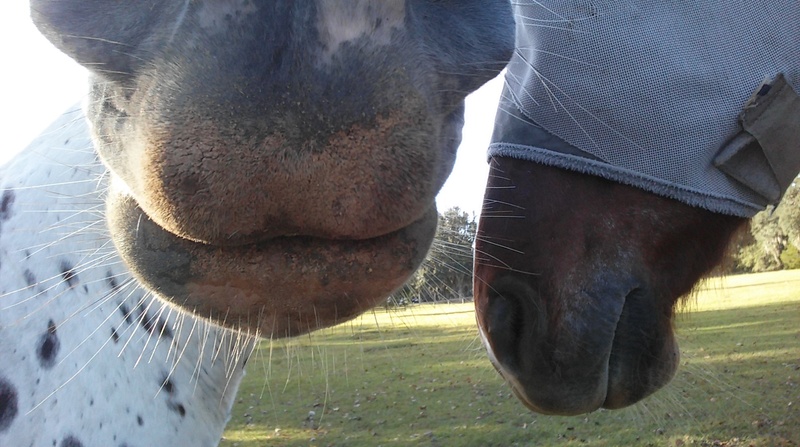 I needed them to know better than to be still standing in a stall at nightfall. I would resort to driving them out with energy, marching down the aisle with the whip, forcing them to wake-up and act for me. 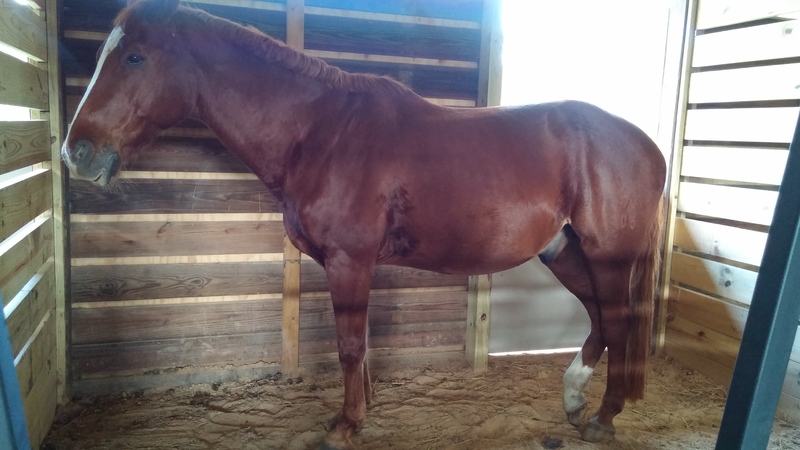 They would often reward me by trotting circles around the outside of the barn, heads and tails held high, avoiding the open gate, requiring me to give persistent chase in the dark. Ugh. Acts of driving are acts of pushing away. The donkeys did not understand, or they did for a while, and then they copped an attitude about it. It did not suit them at all, this lack of attention and being pushed around. They became grumpy and often unmanageable. I tried to solve it by including them in the special needs herd. 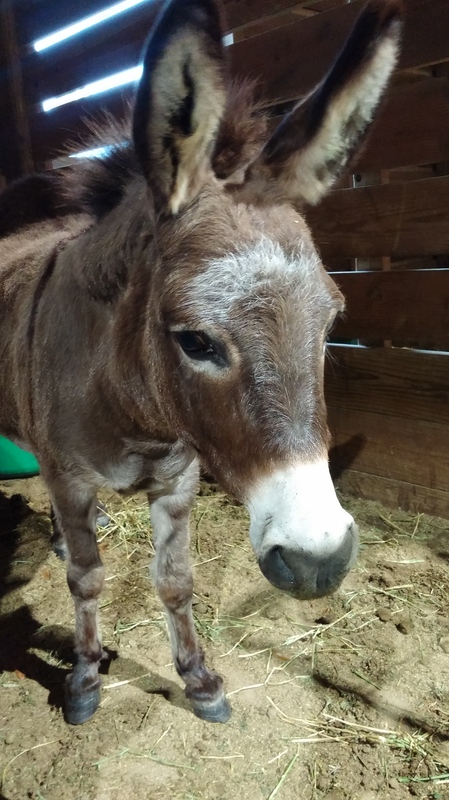 Now, it was just the three boys in the very large pastures and Andante, Filou, Boo, Belle, and the three donkeys in the small pasture next to the barn. That made the donkeys only slightly less grumpy. The story does not get better yet. Driving ceased to work with them. Their energy would come up and they would skitter here and there, but never where I wanted them to go. 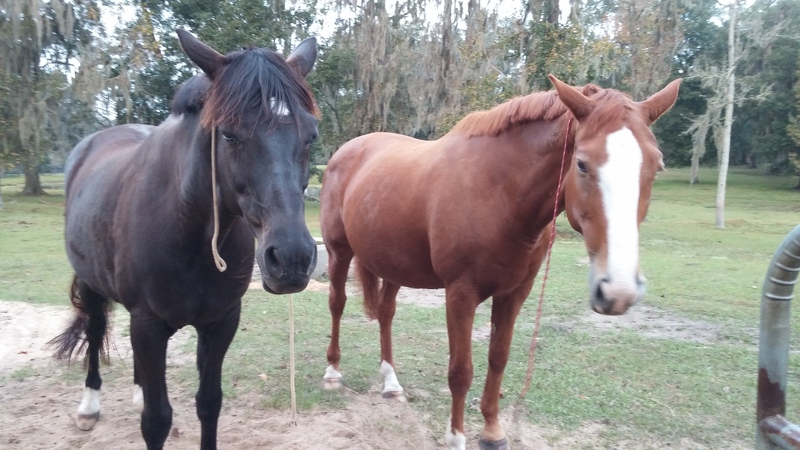 So I dusted off their halters and said — you want dinner, you have to let me lead you there. Except, by now I had lost leadership status with them. You have to catch a donkey to lead a donkey. The best I could get was one out of three to cooperate and that one would become agitated because the other two were skittering along the fence line out of reach and would drag me across the pasture in his efforts to rejoin his tribe.Yes, the story gets worse. Annie started to limp, badly. She had an abscess and needed her foot soaked daily, to help her. She did not see it that way. 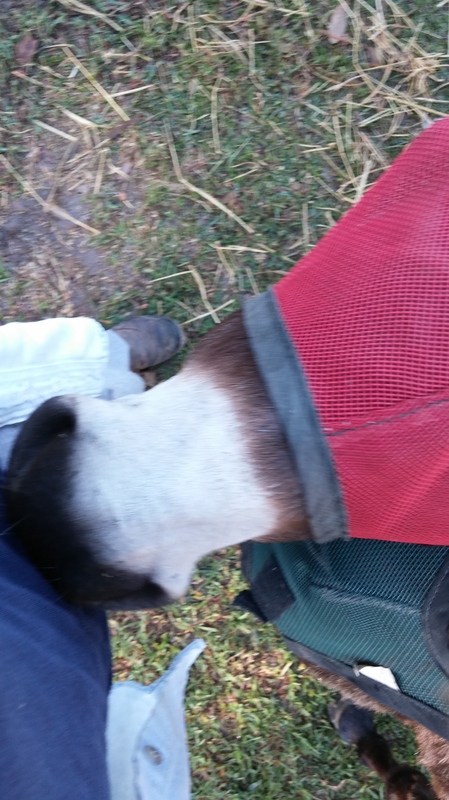 She saw it as a breach of personal space that I would want to pick up her leg, to administer to her. It took tying her tight to a post, hobbling her foot and Gordy putting his weight against her to get her to lift that foot. It was not pretty. The truth is, it registered with me that she was acting out because of the changes in her life and that I should care about that; I did care about that. I was just too emotionally exhausted to try very hard, to try hard enough by Annie’s standards, to make things right. The story gets better from here and, because it does, I can show it to you as well as say it. These past days, we have been in a time of reckoning, the tribe and me. I asked for re-entry, to be a fuller part of them again. Not surprisingly, there has been a price attached to that re-admission. Lesson #1: Don’t call a family meeting unless you are emotionally prepared for the view of you from both light and darkness. Lesson #2: Emotional preparation doesn’t matter, listening does. If you listen, you might learn. I do not drive anyone anywhere. I invite and walk with, using a string around their necks to suggest pace and direction. Can I please lead you by a string around your neck, the two of you and me? Every day, I groom each of them and care for their hooves and water their feed so it’s just the right amount of soupy, the way they like it. I run my fingers on their bodies, rub their ears, cup their eyes – becoming familiar again and I let them tell me when they are ready to go out or come in. I treat the donkeys extra, extra special, crouching low in their space, rotating the food dish so that all are treated fairly. They have been gracious with me, accepting my peace offerings and moving into what we are or are to become without Filou. They are good leaders in that. Annie has forgiven me; we no longer have issues, not with coming or going or picking up feet. I feel her relief. I hope she feels mine. It is as if it never happened, although it did and I will not be the one to un-remember that, to not recall that about myself. On our walkabout today, I stripped Molly of the shirt I was making her wear to protect her backside which is fiercely stitched up from her recent surgery. 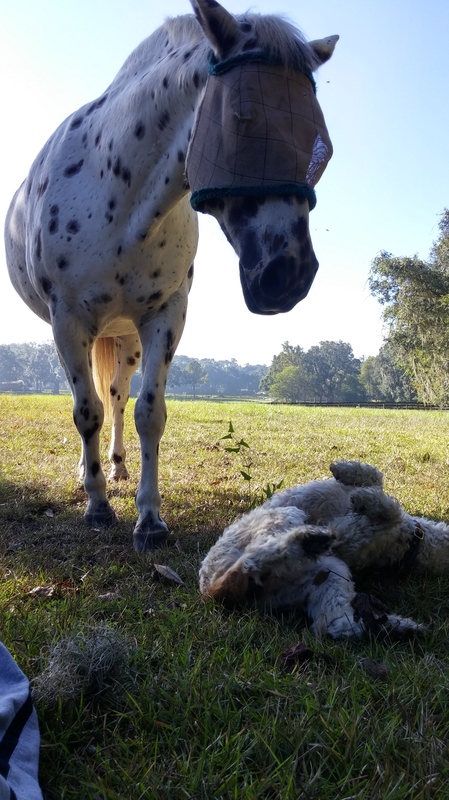 She rolled and stretched with puppy dog delight, rubbing her body on the sweet, sweet earth and all that good energy caused the herd to want to be with us. Loosa came first, holding space for her, being amused on her behalf. One by one, the rest of the herd drizzled over, slow and lazy, happy to be sharing space. Annie bumped her nose on me — me and my worn chambray shirt — to show me we are in this together. 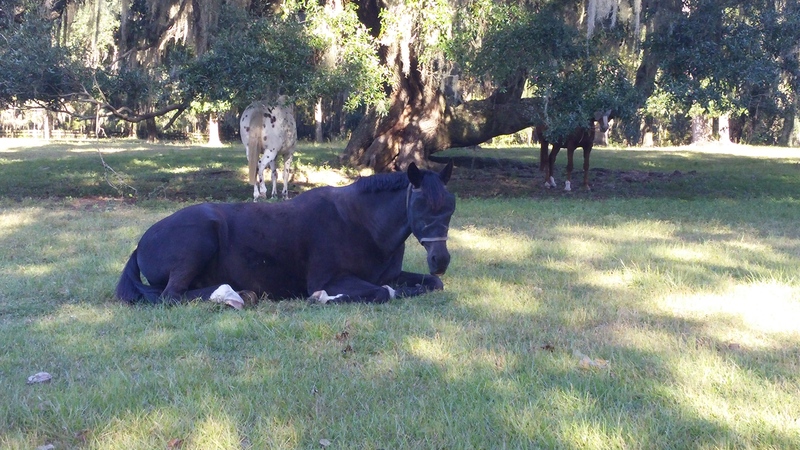 We finished our walk, the dogs and I, and the horses did what calm and peaceful horses do: They took a nap, together, under the Mother Tree. It would seem that we have found our way back to each other; that I am healing, that we are healing. There is too much delight in the living of the life we have to do otherwise. Thank you, Molly. Thank you, my beautiful tribe. Thank you for this touching post. I share some of your feelings, as much of my energy these days goes to caretaking for my elderly father and my much-loved 29 year old mare. Bittersweet times, and sometimes exhausting and frustrating… so I have to be careful to still be calm and nice with my sensitive dog who is middle-aged and healthy and doesn’t always understand. Thank you for sharing, Vicki. Bittersweet is the exact right word — as are exhausting and frustrating! Hugs to you and all you are caring for and about.